I had so much fun reading this book. I was giggling throughout the book and it even gave me a few laugh out loud moments. Sarah and David are bickering about everything throughout the book while trying to survive this zombie apocalypse and this makes for a funny combination. So how are Sarah and David staying alive? Well with loads of luck, who knew a high heel shoe, a doctor Phill book and even a toilet seat would be good material to take a zombie down? Also the loads of (zombie)movies that David watched seem to help a bit. And aiming their frustration towards the zombies instead of each other not only seems to save their lives, but maybe their marriage. The story is told from Sarah's point of view. 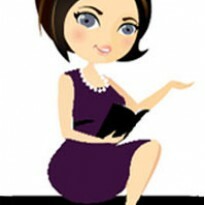 Sarah is funny, witty and brave, she keeps a hold on herself during this zombie apocalypse. I liked her. It's mostly just Sarah and David and the zombies. The few other characters that pop up don't stay long. This is such an entertaining read. Sarah and Dave are bickering about everything and nothing and since they are mostly together that is quite some bickering. Between and during the bickering there is lots and lots of zombie killing action going on in this book. 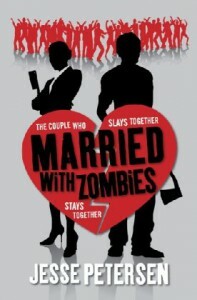 It's not a a romance novel this is zombie mayhem in the most funny way.